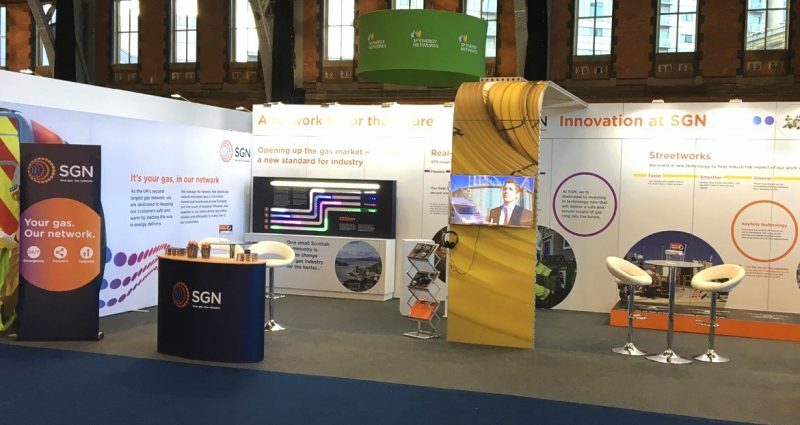 Creating an exhibition stand to represent your business at a trade show may seem like a straightforward task, but in reality it can take a great deal of detailed planning and specialist design expertise. There are many factors you need to take into account to ensure the exhibition stand effectively achieves your business’s objectives. In this article we share some exhibition stand design ideas to help you on your way to trade show success. Before we begin, here’s a photo of an exhibition stand we designed in London, so you know you can trust our advice! Creating a new exhibition stand is exciting and it’s very tempting to jump straight in, by designing a stand based on a specific look that you have in mind from the outset. However without first clearly identifying your trade show goals, and designing a stand based on a developed event marketing strategy, you’ll be setting yourself up for failure. That’s because the most successful stands not only look good, but also function well too. Writing down your goals before starting to design the stand means it’s less likely you’ll miss out vital features, and end up with an under-performing booth. For example, if your main goal is to win new deals by signing up customers right there on the day of the show, then you may need to incorporate an area offering greater client privacy into the design of your stand. If you intend to showcase products by giving demonstrations at the stall, there must be adequate space to safely and effectively carry out the demonstrations. The stand’s design must also ensure that visitors have clear visibility of the demonstrations, and from a variety of different angles; a poorly designed stand where visitors’ views are blocked simply means that you will fail to attract interest and lose out on potential new custom. Identifying your trade show goals from the outset will help you to create a stand that’s not only eye-catching, but also functions perfectly and effectively achieves your business objectives. When you’ve identified your trade show objectives and business goals, it’s important to make sure that your exhibition stand looks as good as it possibly can. 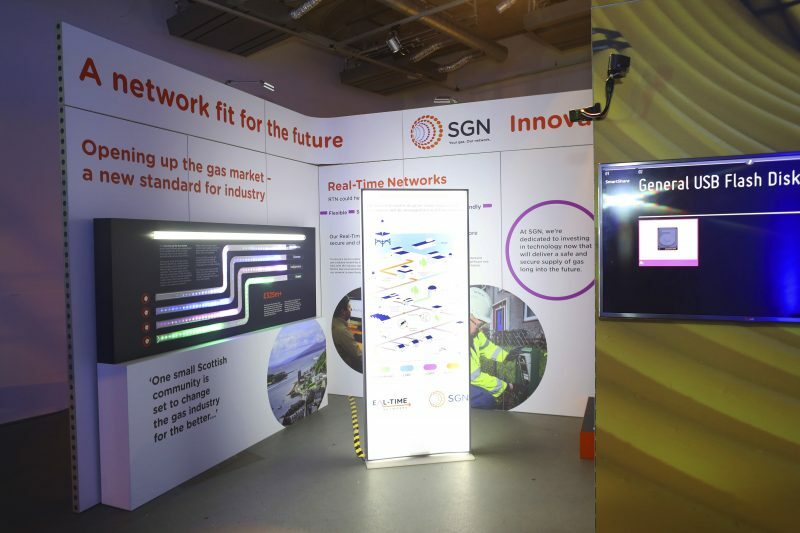 Functionality and appearance work together to maximise performance and when your exhibition stand design effectively incorporates both of these elements, it’s much more likely to have a big impact. A key factor to consider is the graphics adorning not only the stand itself but also the banners, posters, signs and other large marketing materials that you’ll use on the day of the trade show. Large well-designed graphics help your stand to be seen and excite interest in your brand, which is particularly important when you’re exhibiting at a busy show where there’s a lot of competition for the attention of passing visitors. To attract attention at packed trade shows, you’ll need to use tactics to help your booth literally ‘stand out’ from the crowd! You might consider using signs which rise above head height, so that visitors can see them even when the exhibition space is bustling with people. If the venue allows it, hanging signs from the ceiling can be a great way of ensuring your brand gets seen and encourages people to visit your stand. You could also use free-standing signs around your booth, making sure that they’re double sided so that they can be read by visitors passing the stand from both directions. Graphics must be created on a scale that will work on a large structure in a busy trade show environment. Your existing logos and other marketing graphics may look great on letterheads and your business website, but not work as well on the larger scale required by an exhibition stand. You may need to create new, large scale graphics specifically for use in a trade show environment. MAD Ideas are experts in designing graphics on a larger scale, and we can help you to build a visually attractive and effective stand with graphical elements that will get your business seen even in the busiest of trade show halls. The best exhibition stands not only look good and work well, but also incorporate an extra special touch to increase engagement and make your stand memorable in the minds of visitors who will have seen many booths during the day. Getting creative and adding original and fun elements to your stand can make all the difference, and provide the added ingredient necessary to help ensure success. Allowing visitors to get involved by incorporating interactive elements is a great idea. Including touchscreens in your booth, which visitors can tap and swipe to find out more about your products and business, can work really well. If you’re demonstrating products at your stand, involving visitors by encouraging them to try out the product for themselves is exactly the kind of interaction that generates engagement, creates a buzz, and builds a crowd around your exhibition stand. The possibilities for boosting trade show engagement with a quirky stand feature are limited only by your imagination! 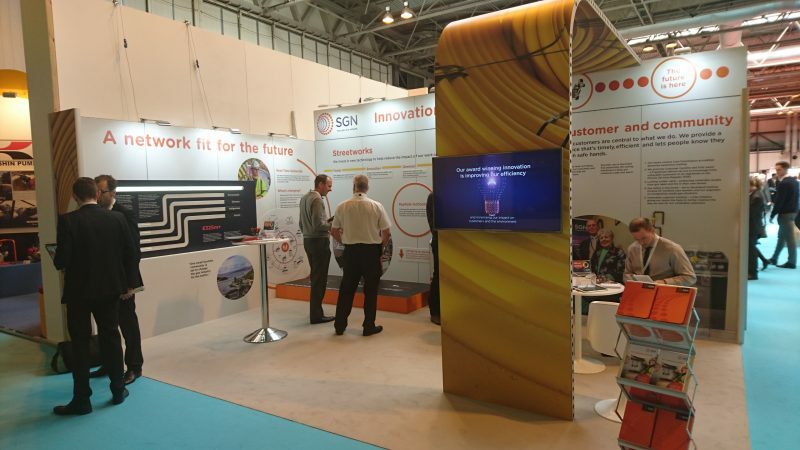 We hope you’ve enjoyed this blog and found our exhibition stand design ideas interesting and useful! 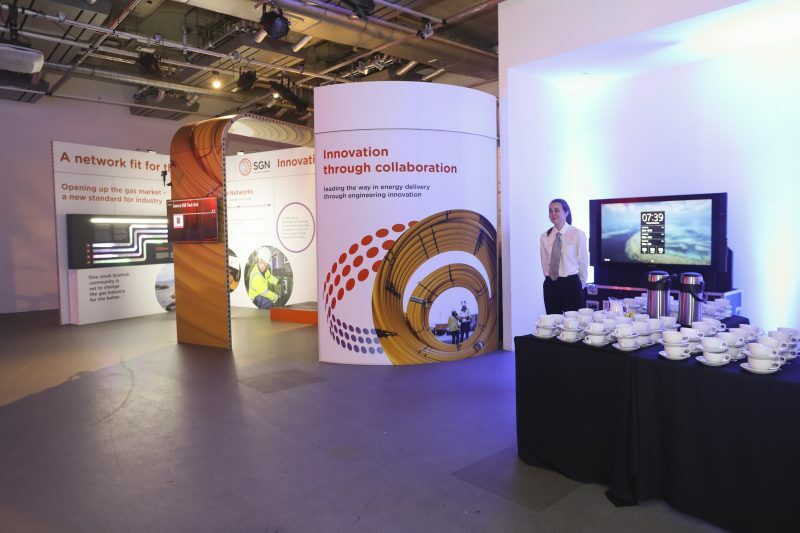 Here at MAD Ideas we specialise in designing and creating exhibition stands and regularly work with businesses in London and throughout the UK. From pop ups and exhibition stands, posters, promotional goodies and branded clothing to brochures and leaflets, we can help you design everything you’ll need for your event. Simply call us today on 01293 773085 and find out how we can create a beautiful and effective new stand for you and take your business to the next level.